Editor's note: Every week CNN International's African Voices highlights Africa's most engaging personalities, exploring the lives and passions of people who rarely open themselves up to the camera. This week we profile former Congolese child soldier and U.S. Marine Tchicaya Missamou. (CNN) -- Tchicaya Missamou's life has in many ways been shaped by the brutal lessons of war. Born in Brazzaville in the Republic of Congo in 1978, Missamou was recruited by rebel forces when he was just 14. "I was taught to kill, I was taught to brutalize," the former child soldier turned U.S. Marine told CNN. 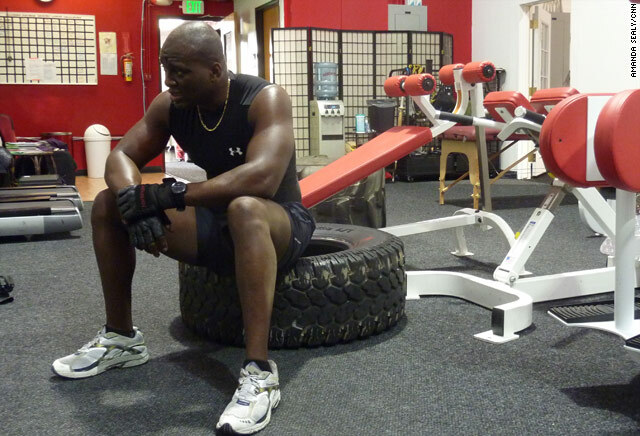 But now Missamou is applying the lessons he's learned from the frontlines to fitness. At his Warrior Fitness Camp in California, his grueling exercise program is helping hundreds of Americans get into shape and lose weight. "My workout is a mind game because I believe when your mind is strong, your body will be strong," said Missamou. Missamou -- whose life story is chronicled in his recently published memoir "In the Shadow of Freedom" -- is no stranger to harrowing experiences. As a child soldier, he says he doesn't remember taking someone's life, "but I recall participating in taking someone's life. I was there. It happened." "We had no choice," he said of his plight as a youth fighter. "Some of the kids were getting drugs, alcohol." But he was able to escape that life after two years, when he was sent away to live with his father, a lieutenant in the local police who convinced him to join the country's elite military force. However, neither father nor son had any idea that a civil war that would eventually claim over 10,000 lives was about to consume the country. Missamou managed to avoid fighting in the Republic of Congo's civil war in 1997 by starting a private security militia that helped white families escape the country. It was an unpopular mission that, according to Missamou, eventually resulted in a mutiny amongst his own ranks. As he and his mother's family were on the verge of fleeing the country, Missamou's own militia cornered him. All my life, I lived in the shadow of freedom. I thought I was free until I came to America. He says the men raped his mother in front of him, brutalized the rest of their family and set the house on fire while they were still inside. He managed to get his mother and another badly injured woman to a medical facility, then fled the country. He arrived in the United States, where he found work at a martial arts studio in California. There he met a recruiter for the U.S. Marine Corps who suggested he enlist. It was peacetime when Missamou signed up for the Marines -- but just three years later, he found himself leading men into battle in Iraq. "Fighting is not fair. It's brutal, you see people killed," he recalled. "We were defending ourselves, defending our values for the good of the people." After six months in Iraq, Missamou returned to the United States to find that the naturalization process for foreign-born members of the U.S. military had been speeded up and that he'd become a citizen. It was a short-lived happiness, though, interrupted by the news that back at home, his father had been imprisoned for helping his son escape the country. Missamou returned to the Republic of Congo to see his father, but was promptly jailed himself. He was shot during an unsuccessful escape attempt but managed to call an old roommate in the United States and was released and sent back to his new country. At home in California, Missamou says being an American was what gave him hope during his time in jail. "You can see I'm very patriotic about America," said Missamou. "All my life, I lived in the shadow of freedom. I thought I was free until I came to America." After eight years in the Marines, he opened the high-end gym where he gives "warrior" classes to help people wanting to shed pounds. "You're going to see them rolling, sweating and crying," said Missamou of his training style. His decision to focus on fitness after he left the military was influenced by his family health history, he says. Both his mother and grandmother are overweight and diabetic. In addition to training at his gym, he visits schools to teach children how to eat right and take care of their body. "When I see them, I see the future," Missamou said. He's also delivering motivational speeches across the country and speaking out about the plight of child soldiers in Africa. "I believe that education is the strongest weapon that we have to change people's way of living," he said. He says his voice has never been louder than it is today, and that after years of struggling against great odds, he has never felt more free. "I'm living in freedom," he said, "I am not dreaming freedom. I am living freedom."